Don't forget the sunscreen! According to the American Academy of Dermatology, over two million cases of non-melanoma skin cancers are diagnosed every year. Wearing sunscreen is one of the most critical methods of disease prevention. Who needs sunscreen when it seems almost everyone want to be tan and beautiful? For a quick visual of the long-term effects of the sun, check out Dr. Darrick E. Antell's photo comparison, which shows a pair of identical twins at age 59. One stayed out of the sun; the other basked in it. It's not surprising to note that there are differences in their skin. What is surprising, though, is the extent of the differences. Vanity is often what makes a person turn to the sun--and away from it. People strive to be tan. However, protecting yourself from the sun is one way to cut down on the lines and wrinkles that develop with time. If you must have that sun-kissed glow, try sunless tanners. If you are not motivated by vanity, health is an even more important reason to wear sunscreen. Just one serious sunburn in your life increases your risk of getting skin cancer by 50 percent. If you add more sun exposure, you up your likelihood. The math is simple. 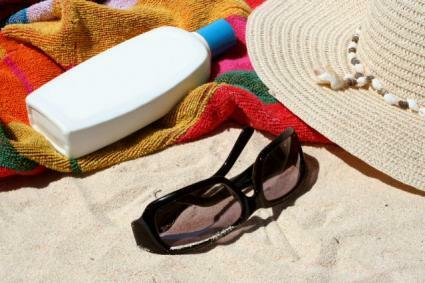 To protect yourself from the damaging UVA/UVB rays, you'll need a sunscreen of at least SPF 15 every day. Since you don't have to be sunburned to suffer damage, you should wear sunblock even on overcast days. Skin cancer is not something to be taken lightly; melanoma is a potential killer. It is also vital that you protect your kids with a high-quality sunscreen. Most of the damage to your skin comes before the age of 18. Good habits learned in childhood will protect your children for life. While not all of these are necessary, at least one must be on the "active" ingredients list for the product to be truly effective. You can order great sun protection products online at places like Cosmetics Cop or just shop at your drugstore for convenient types of sun protection in brands you already trust. Here are some trusted names in sun protection. You can find these products at your local drugstore or online. Coppertone: This leader in sun protection offers sunscreen for all skin types and for children. Banana Boat: Look for sunscreens for the entire family, plus a variety of tanning and after-sun products. Neutrogena: This skincare company carries a wide range of award-winning sun protection for the face and body. Solar Sense: Zinc is the chief ingredient in Solar Sense products. SkinCeuticals: Among this company's many sun protection products is a color-infused formula for the body. California Baby: Go natural with these non-chemical, organic sun protection products for the whole family. You should apply sun protection at least 20 minutes prior to going outside. Try to avoid exposure to sunlight between 10:00 AM and 4:00 PM as much as possible. This is where those dreaded office jobs come in handy! They keep you out of direct sunlight. Don't skimp. You must apply sunscreen liberally to reap the benefits. Your efforts to rub in your sunscreen every morning are pointless if you don't use enough. When outdoors, reapply your sunscreen every few hours throughout the day. Waterproof sunblock isn't completely water resistant, so reapply more frequently if you're swimming or surfing. One more rule to remember: 15 + 30 does not equal 45. In the sunscreen world, the numbers act individually. You can't add numbers to come up with a higher level of protection. Make protecting your skin from the sun a year-round goal--don't just relegate sun protection to summer. Use moisturizers and lip products that have added SPF and encourage the ones you love to be proactive concerning their skin. Your diligence will pay off with healthier, younger looking skin.